What does it do? Let's you page online Nox players and chat in the lobby as yourself or guest account. - Added function to resolve IP instead of set constants. How can I manually refresh user list? Double-click '[updated: 00:00:00]' label. How can I default the Enter key to send to lobby? Right-click 'Send' button. Last edited by kitty on Thu Feb 21, 2019 2:36 am, edited 6 times in total. Is this possible to have version with 3.5 or at least 4.0 .net? Because windows xp users will not be able to use it. Xandros wrote: Is this possible to have version with 3.5 or at least 4.0 .net? Because windows xp users will not be able to use it. .NET 4.5 because it uses System.Http and System.Threading.Tasks for async methods. Converted to BackgroundWorkers, can you confirm it works on XP please? Last edited by kitty on Thu Feb 21, 2019 1:39 am, edited 1 time in total. Windows XP Professional SP3 - works perfectly. The only thing i want to propose - allow user to log in as a normal account, not generated user (pager####). I know my passkey(the "encrypted" password) and login, so i want to use them to filter out stranger's messages in my server log. Xandros wrote: Windows XP Professional SP3 - works perfectly. Xandros wrote: The only thing i want to propose - allow user to log in as a normal account, not generated user (pager####). I know my passkey(the "encrypted" password) and login, so i want to use them to filter out stranger's messages in my server log. Yeah, I tried doing this originally but was unable to reverse engineer the encryption. If you know how, I'd be more than happy to implement. Otherwise I probably won't because not many people will know their own encrypted password. For now, I would suggest modifying the source code for your own needs. Just a matter of changing packet info within ConnectStage2() method. Just look at the default key "HKEY_CLASSES_ROOT\WChat\Nick[1-32]\Pass". You can also just show the user the list of WOL accounts used in Nox. Xandros wrote: Just look at the default key "HKEY_CLASSES_ROOT\WChat\Nick[1-32]\Pass". Well I'll be damned. Very nice. Account creation would be out of the picture but that I don't mind so much. I will implement if I can find some time to do it. Would have to add a lot of new options to make it work the way I want it to. Xandros wrote: The only thing i want to propose - allow user to log in as a normal account, not generated user (pager####). Finished. Just keep in mind, one connection will bump the other offline. i.e. 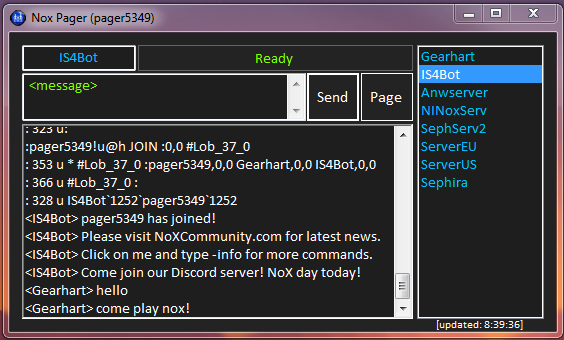 If you're in-game and you launch NoxPager as your own login.